Allotments seem to be a peculiarly British phenomenon. Small parcels of land, divided into smaller still plots, furnished often with a shed and make-shift cold frames, greenhouses and what have you, where, in time-honoured tradition, old men in baggy corduroys and cardigans go to smoke a pipe and gaze out on serried ranks of cabbages, leeks and potatoes. But they are also places where young families are growing their own food, where immigrants are introducing new kinds of fruit and veg, and where people can find a respite from the city. Just recently, they’ve become the backdrop to yet another reality TV “game show”. In that respect, perhaps, like cooking food, growing food may be more of a passive entertainment than an active pastime. Nevertheless, allotments remain in demand. They have a long history, born out of food riots and strife, and in many cases a threatened future as the land they occupy is much more valuable for building plots than for garden plots. Jane Perrone, gardening editor at The Guardian, spilled the beans. Jane Perrone’s book The Allotment Keeper’s Handbook: A Down-to-Earth Guide to Growing Your Own Food is available from Amazon and elsewhere. She also has a blog. James Wong’s Homegrown Revolution is the book Jane Perrone credited with introducing people to new things to grow on their allotments. I am interested in knowing more about the presence of heavy metals and other pollutants in urban or peri-urban soils used for growing food. Are these allotments (in the UK) so old that no polluting activity was ever carried out on them before they were turned into allotments? Are polluted urban spaces unknowingly turned into food growing lots? Does urban soil pollution actually pose a serious health risk to urban food eaters? In Berlin, Germany, air pollution is a problem (who knew, in such a green city): food grown near roads have nefarious deposits that pushed the city to warn the citizen to wash their harvest thoroughly. Ancient train tracks and right-of-ways have a history of heavy herbicide use (in the Netherlands, in Canada) and polluted run-off accumulation. The story of the birth of the allotments told by Peronne in this podcast (privatisation of the commons over time, 2m 55s) has bits of information on the activities carried out on these lands before they were turned into food growing spaces. I understand the process took place early during the industrialisation of the country, making me think the soils of these allotments are not heavily polluted. But that may not bne the case for allotments in and around cities of other regions/countries. 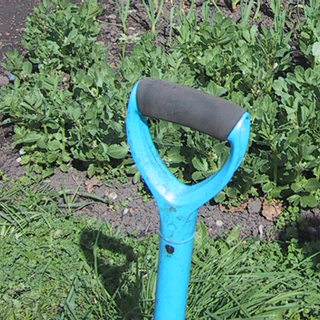 “Allotments seem to be a peculiarly British phenomenon”. I think they are really quite common on the continent as well. There is even a European federation. Here is a Dutch 1950s propatainment movie on city folk and their allotments. And I should mention the Russian daschas.